Giovanni Paolo Panini Piacenza 1691 - 1765, Rome. 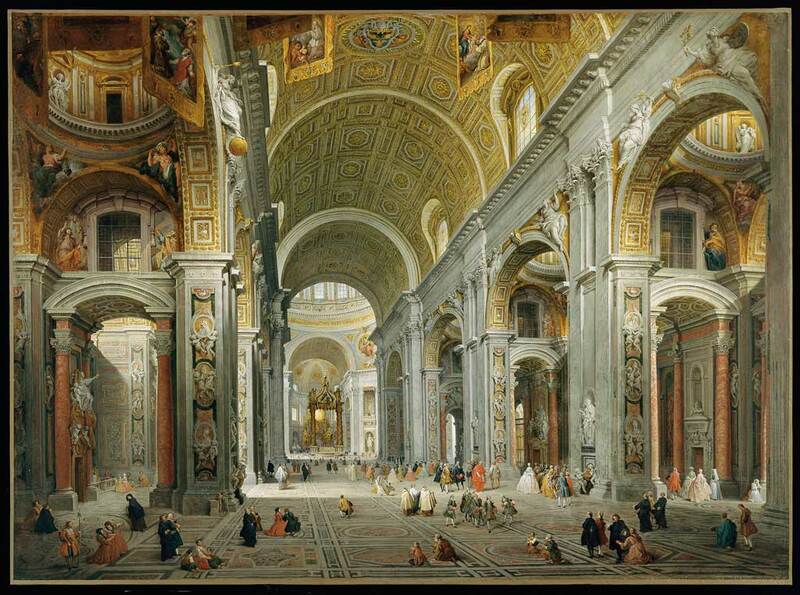 Interior of St. Peter's, Rome, 1756-1757. Oil on canvas, 64 5/8 x 92 ¾ in. Athenæum purchase, 1834. This large painting of the interior of St. Peter’s in Rome is one of the four views of Rome by Giovanni Paolo Panini that the Boston Athenæum purchased in 1834 and the only one remaining in the collection. The four canvases—Interior of St. Peter's, Rome; View of St. Peter's Square with the Departure of the Duc de Choiseul; Interior of an Imaginary Picture Gallery with Views of Ancient Rome; and Interior of an Imaginary Picture Gallery with Views of Modern Rome—were commissioned in 1756-1757 by Étienne François de Choiseul-Stainville (1719-1785; created the Duc de Choiseul in 1758), a prominent French statesman and diplomat under Louis XV, who was then in Rome as the French ambassador to the Vatican. In all four, Panini painted his patron as part of the scene; here the ambassador and his entourage are depicted sauntering in the magnificent basilica, in the foreground slightly to the right of the center (fig. ). The massive Roman paintings were meant to serve as glorious souvenirs of Choiseul’s prestigious Roman appointment. Originally from Piacenza, Giovanni Paolo Panini (1691-1765) was one of the most successful “view painters” of the Settecento, and aristocratic Europeans on the Grand Tour had a seemingly insatiable appetite for his views of ancient and modern Rome. Panini’s were accurate and objective depictions of actual buildings and monuments, although they were sometimes assembled in imaginary compositions. Catering to an illustrious list of patrons, Panini repeated many of his most popular views throughout his career, but modified them to record the changing appearances of their subjects over time. Panini painted at least six signed versions of the Interior of St. Peter’s beginning in 1730, and the Athenæum’s, from 1756-1757, belongs to the third and last group of the interior, with gonfalons hanging from the ceiling of the basilica, evidently marking the holy year of 1750. Today Panini’s more factual kind of art tends to pale against the more overtly classical and darkly evocative work of Piranesi, but in his day Panini did much to reinforce the nostalgic perception of Italy as the land of monumental grandeur and beauty. No single national group succumbed to this particular vision of Italy more readily than the British in the eighteenth century, and the vision would be adopted wholeheartedly by Americans in the early nineteenth century. The flamboyant Choiseul, ambling here in the basilica, soon returned to France with Panini’s four Roman views, but it is not known where—in Paris or at his Château de Chanteloup on the Loire—Choiseul kept them. Choiseul’s political fortune abruptly fell in the 1760s, and in 1772 he sold the Paninis to a friend, Jacques-Donatien Le Ray de Chaumont (1725-1803), whose château was near Choiseul’s and with whom Choiseul shared a passion for the arts and an intense Anglophobia. Well connected to the government, De Chaumont offered a vacant house on his estate at Passy, outside Paris, to Benjamin Franklin and his legation when the American ambassador arrived in 1776, and Franklin lived there happily for nine years, on thoroughly friendly terms with De Chaumont next door. It has been suggested that Franklin may have seen the Athenæum’s four Paninis, then in De Chaumont’s possession, either in Paris or at the château, but there is no evidence of this. The paintings descended to De Chaumont’s granddaughter, Marie-Thérèse, who married the art collector Pierre-Armand-Jean-Vincent Hippolyte, Marquis de Gouvello (1782-1870) in 1816. The Marquis sold the paintings to the Boston dealer William J. Davis in 1834, who sold them to the Athenæum in the same year. After the regular exhibition closed in the late summer of 1834, a special show opened at the Athenæum gallery, which Davis had rented for $200 to exhibit the four Paninis for sale. The four large Roman views must have looked splendid at the Pearl Street Athenæum, and apparently they made the gallery “the center of attraction to all again.” The catalogue described the four Paninis at length in extravagant terms, and the Interior of St. Peter’s was praised for its breathtaking verisimilitude as well as for the majestic scale of the church itself. By late October the Trustees of the Athenæum had met to discuss the Roman paintings, but the asking price for the four, $8,000, was clearly a problem. With alacrity letters from prominent artists—Samuel F. B. Morse, Chester Harding, and David Claypool Johnston, among others—were solicited and received by the Trustees, with repeated praise for the Paninis as “the finest pictures of this class.” Trustees still wavered, first voting to buy perhaps one or two of the four and then rescinding the vote; they eventually decided to pay $4,000 from the Fine Arts Fund (by selling bank shares) and to raise the balance by subscription. By late November the subscription collection had reached $2,000, and Davis generously accepted the sum of $6,000 for the four canvases. By early December the paintings belonged to the Athenæum and the gallery was warmed and lighted for a few days to allow for special viewing by the subscribers. Within three years, however, the Athenæum exchanged two of the four Paninis for two different paintings: Judith with the Head of Holofernes, a copy after Guido Reni (1575-1642; see entry 56), and The Angel Gabriel Warning Joseph to Flee into Egypt, then attributed to Ludovico Caracci but now thought to be by a follower of Giovanni Lanfranco (1581-1647). Eager to enlarge its art collection, the Athenæum considered exchanges a convenient way to generate interest and attendance, and thereby revenue, for its gallery without additional expenditure. The financial panic of 1837 may have made this exchange particularly attractive as well. The English dealer John Watkins Brett, who had proposed the exchange, sold the two Paninis—Interior of an Imaginary Picture Gallery with Views of Ancient Rome and View of St. Peter's Square—to Lord Francis Egerton, later 1st Earl of Ellesmere, thereby returning them to Europe. The remaining two were placed on deposit at the new Museum of Fine Arts in 1876, where Interior of an Imaginary Picture Gallery with Views of Modern Rome, now owned by the Museum, is still on view. The Interior of St. Peter’s, Rome, returned to the Athenæum in 1947 and is undeniably one of the brightest highlights of the collection today. Hina Hirayama, from, Stanley Ellis Cushing and David B. Dearinger, eds., Acquired Tastes: 200 Years of Collecting for the Boston Athenæum (2006): 194-197. Copyright © The Boston Athenæum. For the most thorough description of three of the four paintings (except View of St. Peter’s Square) see Edgar Peters Bowron and Joseph J. Rishel, eds., Art in Rome in the Eighteenth Century (London: Merrell, in association with Philadelphia Museum of Art, 2000), 425-429. For information on Panini, see Art in Rome (2000), 416-417; and Ferdinando Arisi, Gian Paolo Panini (Soncino, Italy: Edizioni dei Soncino, 1991). One of their joint ventures was the construction of a kiln, to which Choiseul invited the colorful Italian sculptor Jean-Baptiste Nini (1717-1786). The Athenæum received a serendipitous gift in 1954 of three terracotta medallions by Nini made at the kiln, including those of Franklin and of De Chaumont (fig. ). For information on Franklin’s host, Jacques-Donatien Le Ray de Chaumont (1726-1803), see John Bigelow, “Franklin’s Home and Host in France,” Century Illustrated Monthly Magazine 35 (March 1888): 741-754; and Thomas J. Schaeper, France and America in the Revolutionary Era: The Life of Jacques-Donatien Leray de Chaumont, 1725-1803 (Providence & Oxford: Berghahn Books, 1995). Marie-Thérèse Le Ray de Chaumont has often been erroneously identified as the daughter of Jacques-Donatien Le Ray de Chaumont, but in fact she was the daughter of his son by the same name, who was known in America as James Le Ray de Chaumont (1760-1840). James was sent to America in the 1780s by his father to look after his account with the American Congress; James stayed in America and purchased a large tract of land in upstate New York, but returned to Paris permanently in 1836. The first advertisement for the Panini pictures appeared in the Boston Evening Transcript on September 11, 1834, followed by another on October 7, announcing the addition of twenty-three European paintings to the exhibition, to be on view for one week. See Descriptive Catalogue of the Four Magnificent Paintings of the Most Interesting Monuments of Ancient and Modern Rome, Being the Original Pictures Painted for the Duke of Choiseul, a Minister of Louis XV by the Cavalier Giovanni Paolo Panini. (Boston: W. W. Clapp, 1834) for the list of the twenty-three. “Ten or twelve” of the twenty-three had just been purchased by Davis from the Marquis de Gouvello, although they were not identified. William F. Cary to Thomas Graves Cary, December 26, 1834. From the twenty-three, William J. Davis sold to the Athenæum three paintings in 1834 for the total of $400: Jean-Francois Hué, A Shipwreck (or A Storm & Shipwreck); Sebastien Bourdon, Landscape; and after Velasquez, Playing at Morro (Market Scene). Columbian Sentinel, September 20 1834. Samuel F. B. Morse to William J. Davis, October 24, 1834. Trustees voted to buy “one or two” of the four, at $2,000 each, on October 29, 1834, but on November 7, voted that “the purchase in question [was] inexpedient” in the current financial state. On November 29, however, Trustees recorded that public subscription had already raised $2,000; strangely, there is no record of the vote that authorized the payment of $4,000. Trustees Records. The selling of bank shares, which raised $3,000 toward the $4,000, is recorded in the letter from Thomas Wren Ward, Treasurer, to the Trustees, December 10, 1834. Trustees Records, November 29, 1834. Trustees Records, 9 December 1834. The exchange was authorized at the Trustees meeting on September 14, 1837. The copy after Reni was valued at $1,750, and reputed to be from the collection of the Colonna Palace in Rome, an assertion supported by George Watson Brimmer (see entry 24) in a letter dated April 24, 1838. The copy is mentioned by Nathaniel Hawthorne in his Italian Note-Books, written in 1858: “the Judith of Guido, a copy of which used to weary me to death, year after year, in the Boston Athenæum, ” Nathaniel Hawthorne, Passages from the French and Italian Note-Books of Nathaniel Hawthorne (Boston: James R. Osgood & Co., 1876), 196. The painting was sold in 1906 at an auction. The Angel Gabriel Warning Joseph was valued at $1,250 in the exchange. The painting was placed on deposit at Boston College in 1905 but returned to the Athenæum in 1982. The two paintings descended through the collections of the Earls of Ellesmere (Duke of Sutherland). Interior of an Imaginary Picture Gallery with Views of Ancient Rome is now in the collection of the Staatsgalerie Stuttgart, and View of St. Peter's Square in that of the Duke of Sutherland, Mertoun House, Melrose, Scotland.